How do babies develop a sense of self? When does this realization occur? 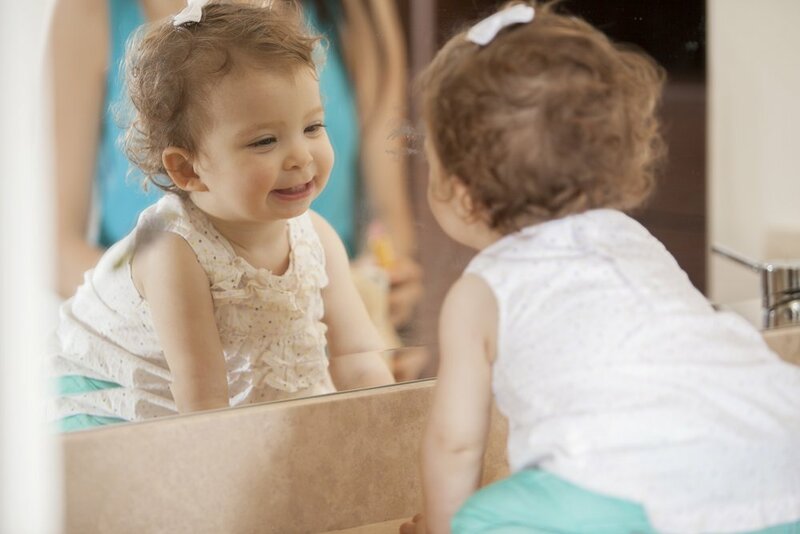 Does your little one recognize herself in the mirror? That’s only one part of a much more complex process. Research has found that from the moment they are born, babies are well aware of their own bodies. Body awareness is a key skill that helps distinguish oneself from others. Since birth, they are exposed to information related to who they are –they can touch their faces and body and exert their influence on the world that surrounds them. “Selfhood starts at birth, but children don’t start expressing an “idea of me” until toddlerhood” (Ross, Martin, & Cunningham, 2016). At around the second half of your baby’s first year, she will begin to respond to her name. At first, she might simply stop to listen and focus her eyes in your direction when you call for her. Later on, closer to her first birthday, your little one will respond by turning, crawling, or even taking a few steps towards you! Nearing their second birthday, children develop a sense of self. In other words, they can think about themselves from the point of view from someone else. One indication of this is when children start recognizing themselves in a mirror or photograph, most children can do this at around 18 months. To notice if your little one does recognize herself in the mirror, you can carry out a small experiment at home. Without letting her know, place a mark on your little one’s forehead. For example, you can give her a kiss when wearing bright lipstick. Then, let your little one look at her reflection in the mirror. If she reaches up to touch her forehead, then that indicates that she recognizes that the image in the mirror is her. You can also notice your little one’s developing sense of self through her expanding vocabulary –specifically self-referential and possessive words like I, me, my and mine. Are these words part of your toddler’s vocabulary? To help your little one create a positive sense of self, you have to let her develop in ways that are attuned with her innate qualities and personality. Respect your little one’s individuality, so that she, in turn, can build her self-confidence and take on life’s challenges enthusiastically.